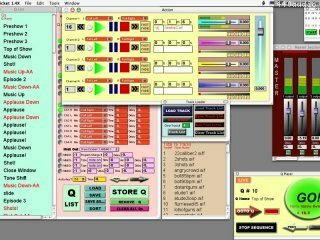 Cricket is software designed to run theater sound & music on your Macintosh computer.  Cricket is in development using the stateoftheart MAX/MSP programming environment by cycling74.  Developed by a theater sound designer and musician, with help from other designers and musicians, so built and road-tested for flexibility, playability and ease.  Coreaudio compatible. Use all your sound card's available outputs to create a true surround-sound environment. 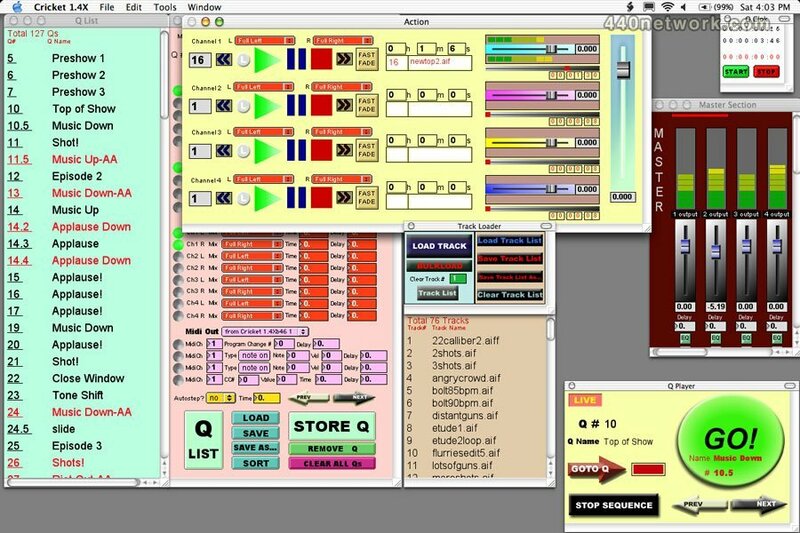  4 separate track players can handle 4 stereo files simultaneously.  Support for all common types of sound files with any bit depth your sound card can handle.  Midi Q-ing includes Program Change, Note On, Note Off, and CC control.  1 Q can trigger all 4 track players, all 4 stereo channel faders, all 8 mixes (for pans, etc. ), all 4 types of midi Qs, and can auto-step to the next Q.  Number or Letter your Qs (including decimal-point Q-ing).  Train anyone to run your sound or have fun running your own sound!  Audio triggers instantly and makes for a precision design.  Run from your laptop for a portable professional 24-bit surround sound solution.